The first step for a personalised surgical approach is to plan the ideal post-operative bone shapes and/or configurations. This enables drilling and osteotomy angles to be calculated. 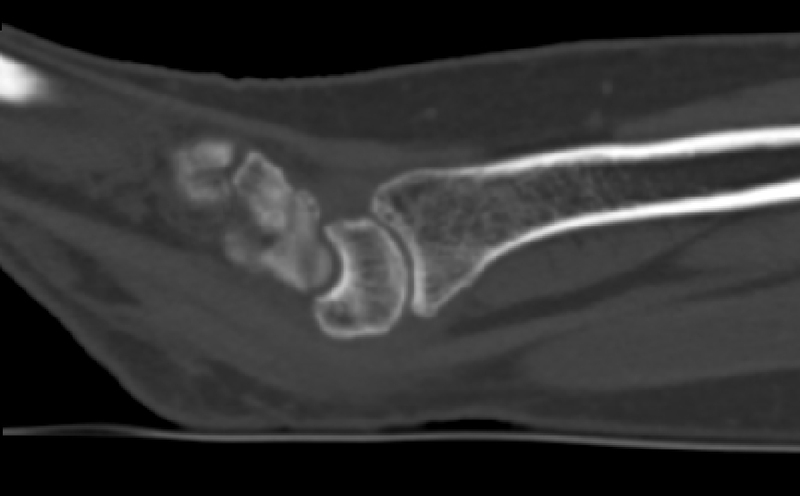 Shown right is a CT images of a distal radius (forearm) with wrist bones. Surgical plans are use CT images to create 3D reconstructions of the anatomy, from which the surgical plan is made. 3DMorphic technology rapidly generates devices that are adjusted to fit a specific individual’s anatomy. This is achieved through the adaptation of existing (generic) devices. Patient-specific or ‘personalised’ devices may simplify surgical procedures through reducing time in Operating Room; assisting to guide bone fragments into place and reducing need for bone burring; and avoiding any need for intra-operative device adjustment (e.g. plate bending).